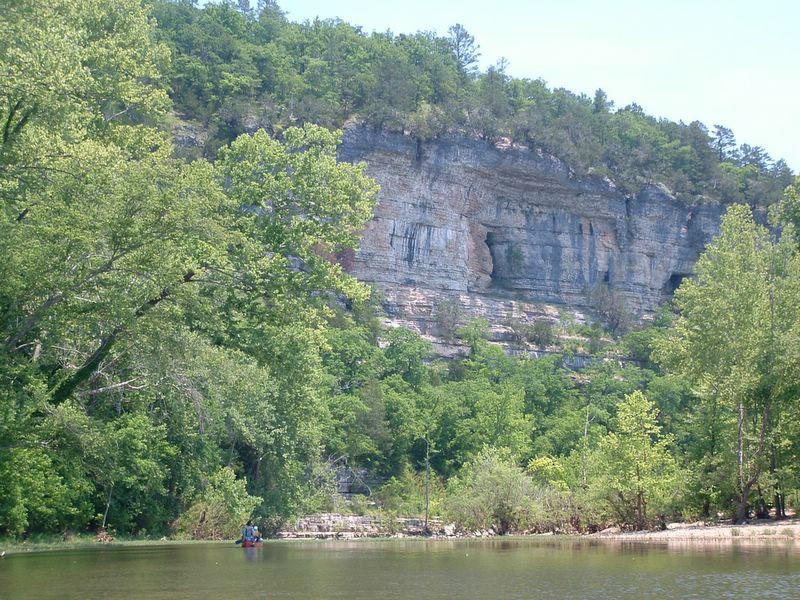 Monday May 22nd we canoed from Ozark to Carver for a total of 13.9 miles. We originally had a 20-mile day scheduled, but with the heat and low water we downsized. 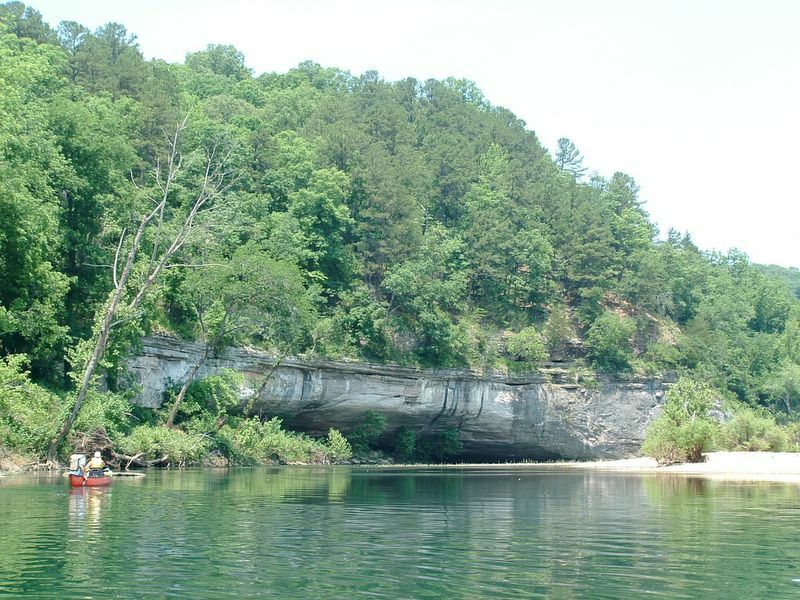 We paddled past the merging of the Little Buffalo River and it was "little", hardly a trickle coming out. There were more deep pools between riffles on this stretch of river and we could see more fish. All kinds and sizes were swimming under our boats, but our fisherman were not fishing much today. The Long Nose Gar was especially interesting to see. The water was so clear that at times you cringed waiting for your canoe to scrap rocks but then you flowed over them with ease. We saw a black snake and 4 water snakes today, including the 2 in the tree branches that Harold pushed Tony into. Something was said about never seeing someone slide to the bottom of a canoe so fast. After reaching Carver, Jeff and Paul W. shuttled everyone downstream to one of the main campgrounds in the Park, Tyler Bend. Again they had a beautiful campsite picked out. And Tyler Bend has HOT showers. While trying to cook supper, the pump assembly on Paul’s 2-burner Coleman gas stove broke. Oh to be doomed so early in the trip. But wait, Harold came to the rescue with a NEW pump assembly, still in the package. Harold must have been a Boy Scout!! Tony made some pineapple upside down cake in the dutch oven that came out pretty good and we all sat around and ate, talked and enjoyed the heat. We didn’t even have a campfire tonight cause it was so hot. 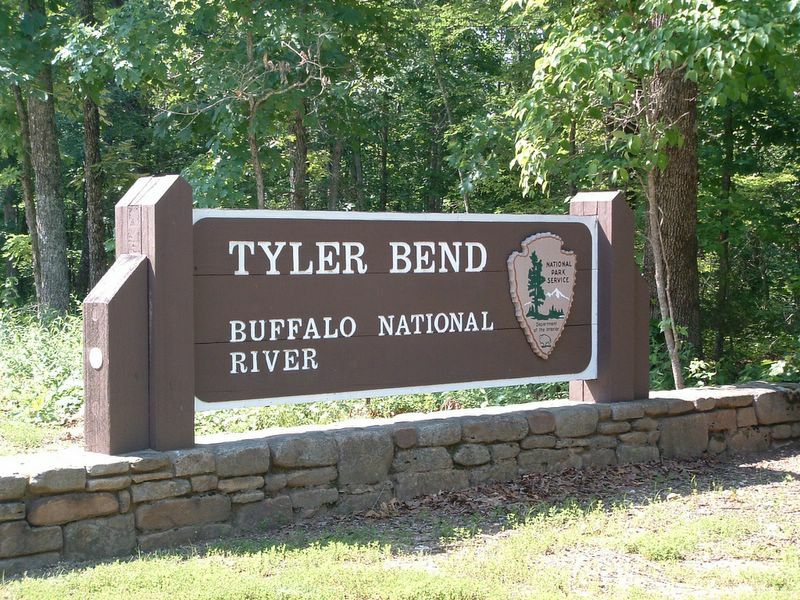 Tuesday May 23rd we drove upstream to Baker Ford, another launching site and floated beyond Tyler Bend to the small village of Gilbert. A total of 10.9 miles. As we were getting our gear into the canoes, up drives a school bus full of high school seniors with rental canoes. They beat us to the water but we quickly passed them as they played and swam. Upon talking with them we found out they graduated the Sunday before and were on a senior trip. One guy even wore his graduation cap. Rounding a bend we came across a big rubber raft with six people on board. Talk about a way to party on a river!! Best day yet for the water was much deeper in this section and the solo canoes didn’t scrap at all. After reaching Gilbert Landing, Laurie and Tony waited for Harold to get his vehicle while everyone else went on to camp. 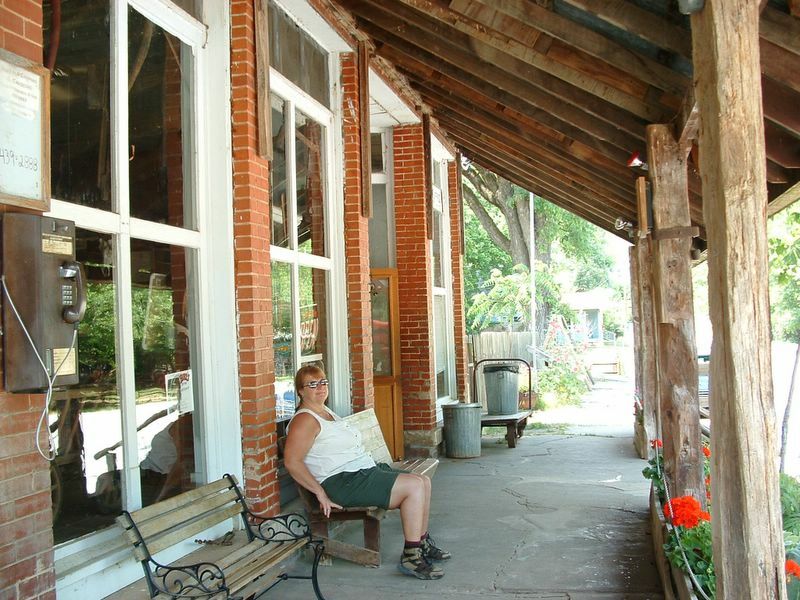 Gilbert was a thriving town in 1902 when the railroad came in, but today all there is are a canoe livery, some cabins for rent, a small restaurant, post office and the Gilbert General Store. The store had cold drinks and ice cream and it had that old time character to it. We sat on the storefront wide covered porch, on benches that could have been from1902. The wood was so worn from many years of use. Upon arriving back at camp, Harold and Laurie packed up. They had to start heading home due work commitments. Jock’s back was messed up, Paul W’s. transmission was acting up on his van and Paul K. was ready to call it quits. They decided to leave in the morning, which left Jeff and Tony without a shuttle. Jeff still hadn’t put his canoe in the water and the heat and sun was getting to everyone. By 8:45 in the morning everyone was headed back to Ohio. 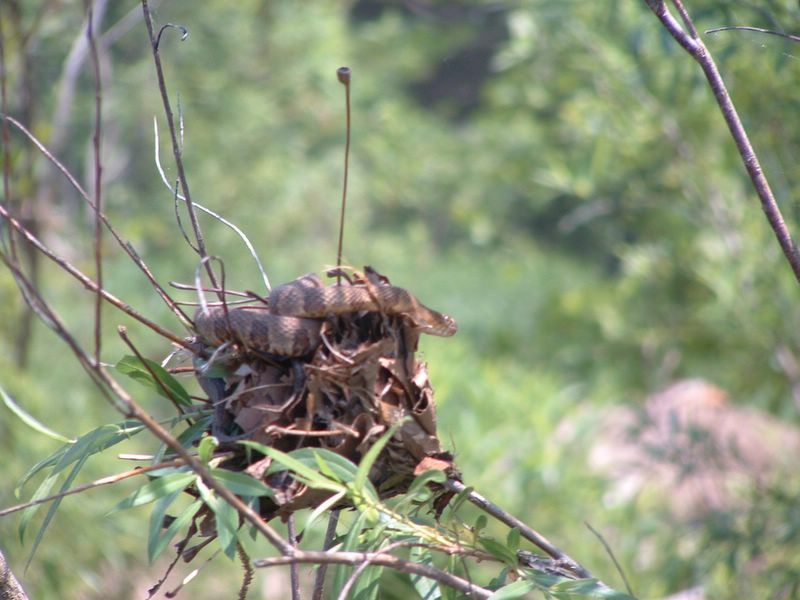 We had a good trip and saw a decent amount of wildlife, turtles and more turtles, fish, buzzard’s, deer, armadillo (couldn’t get a picture it moved too fast), rabbit’s, bluebirds, cardinal’s, herons, squirrels, butterflies, moths, beetles and more than our share of snakes. In fact, we all agreed that we saw more snakes here than in Ohio in the last 5 years total. We got in roughly 46 miles of canoeing and saw some very beautiful country. The Park can be a very busy place on the weekends and the water levels can change so quickly either up or down. Be prepared to do something else if the canoeing isn’t any good, such as hiking or eating. 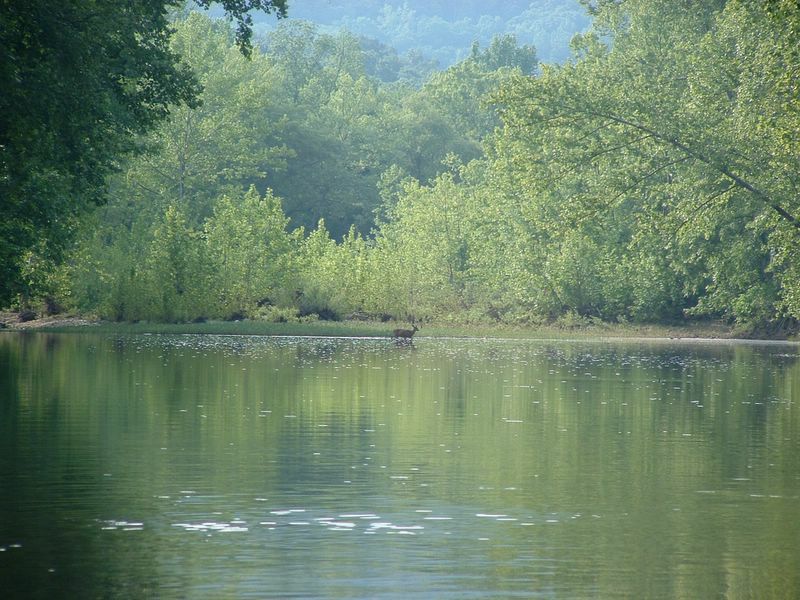 Being on the river or high above it on a ridge are two completely different experiences. A paddle on 10 miles of water could mean a shuttle of 60-70 miles, so remember to plan that time into your day. Water was available at most campgrounds but not all. Plan ahead. Oh, and about planning ahead…if you want alcohol, buy it in Missouri cause it’s a dry area around the Park!! !